Thanks for having me here. I'm 45 years old, live in the Mid-Atlantic, and have had a really full, amazing life so far...given that I've been living with ADHD and didn't know it until a year ago. Well, I knew there was always something "wrong" with me, but I'd learned to work with the tools I had. About 4 years ago, I quit smoking (I'd been smoking for almost 30 years - yes, I was 12 when I started), and all of the mental illness I'd been self-medicating completely derailed my life. I began trying anti-depressants, one of which caused crippling panic attacks. I was diagnosed with anxiety and depression, but I couldn't function on any of the old stand-by drugs. So, I began a regime of therapy, St. John's Wort, and breathing exercises and progressive relaxation, yoga, and exercise. 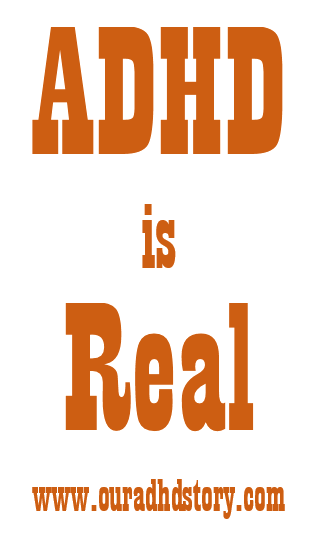 After about six months of therapy, my therapist suggested that I research ADHD. Suddenly, my life made sense. I decided not to seek an immediate diagnosis because I didn't want to go through the pill nightmare again. I read as much as I could, listened to as many podcasts as I could, and started to try to implement even more coping mechanisms than I'd already developed. It worked, for the most part, but when my youngest daughter (she's 8) started to exhibit the things I'd done when I was her age, I started to feel like I needed to get as much control over my brain as possible, so I could give her the best help. We are very much alike, both Type A gals, and in the morning, there wasn't enough room in the house for both of our attitudes. So, I decided to get diagnosed and then medicated. The diagnosis came last year, and I tried Focus Factor first, which did nothing for my focus, but helped a lot with the depression, strangely. I also started a more aggressive exercise plan, becoming a runner and scheduling some kind of workout 6 days a week. This January, I started Strattera, which wasn't hateful, but I just wasn't getting the bang for my buck that I was looking for. Yesterday, I started Focalin. I work full-time as the clerk at a manufacturing facility that makes concrete pipe. It's a perfect job for me. I grew up as an army brat, I did a little time in the army myself, and I was married to a soldier for about 10 years. I'm re-married, have several adult children, and the second-grader I mentioned, two dogs, two cats, I'm a musician, a runner, and I drink a lot of coffee. I have a great (inappropriate?) sense of humor. I've lived in a few different states, Germany twice. I love nature, as long as I have insect repellent and I don't have to sleep or eat out there.